While Mission: Impossible Rogue Nation is an adequate entry in the Mission: Impossible franchise, it is not the standout film that it could, and should, have been. However, saying that, it is still miles above most of your standard action films. 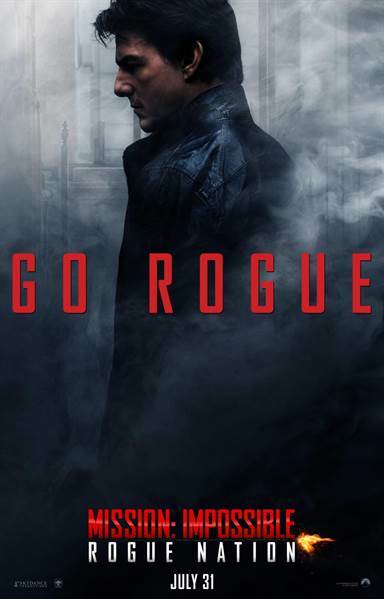 It has been nineteen years since the first Mission: Impossible film, and, this week, Ethan Hunt (Tom Cruise; Edge of Tomorrow, Top Gun) is back in it's fifth outing, Mission: Impossible Rogue Nation. Things haven't been going so great for Mr. Hunt since we last saw him in Mission: Impossible Ghost Protocol. The IMF (Impossible Missions Force) is on the verge of being disbanded by a government oversight committee, and the secret group he has been tracking, The Syndicate, is bigger than it ever was. Unfortunately, this leaves Ethan, and his band of loyal friends, searching for a way to save the world with even the "good guys" against his every move. To help Ethan along on his impossible mission are some blasts from the past, including Benji Dunn (Simon Pegg; Star Trek Into Darkness , The World's End), William Brandt (Jeremy Renner, Bourne Legacy, The Avengers), Luther Stickell (Ving Rhames; Pulp Fiction, Con Air), and femme fatale newcomer Ilsa (Rebecca Ferguson; Hercules). The chemistry between the returning actors and Tom Cruise is almost perfect. Simon Pegg's and Luther Stickell's scenes do not feel like the actors are acting, it is just as if two people are in a natural flow of conversation. Unfortunately, the same can not be said for Jeremy Renner's character. Each time he is on screen it looks like it is a struggle for him to stay in character while spouting his lines. It is almost as if he is reading from a whiteboard that is held off camera for him. The breath of fresh air in the series comes from leading lady Rebecca Ferguson. She plays the character well; whether it's using her character's womanly charms on Ethan, or disarming a Syndicate agent in about 15 seconds, she is a joy to watch on the screen. One great aspect of the Mission: Impossible films is that each film has its own unique directorial style and Mission: Impossible Rogue Nation keeps that tradition going. Gone are the cartoonish elements from Mission: Impossible Ghost Protocol to make the film a more realistic and grittier action film by director, Christopher McQuarrie (Jack Reacher), and while the tone is a bit more realistic, it also makes the film seem a bit unpolished, a first in the Mission series. Instead of scenes flowing from one to the other, you are more jolted from one to the next, which makes the audience take a few moments to transition their brain to the next scene. It is as almost as one can feel the director say "cut" and then next scene moved into place before "action" is shouted to the actors. Distracting you from some of these directorial elements is some fantastic stunts that are all real, a feat that is mind-blowing for this day and age. From Tom Cruise holding on to a real airplane while it is flying, to car chases with no breaks through 14 city blocks, and then to top it off with Tom Cruise diving into 75,000 gallons of water without an oxygen mask, the film ups the stakes on the lengths an actor will endure to make a great film. Download Mission: Impossible Rogue Nation from the iTunes Store in Digial HD. For more information about Mission: Impossible Rogue Nation visit the FlickDirect Movie Database.